I dont have much knowledge about financial oriented. The internet company World Economic Forum released complete list of countries Financial Development Report of 2012. The Report presents the rankings of the Financial Development Index, developed by the World Economic Forum in collaboration with the academic community, multilateral organizations and business leaders. It assembles a vast amount of data to create an assessment of the different aspects of complex financial systems, including the institutional environment, the business environment, financial stability, banks, capital markets, and overall capital availability and access. 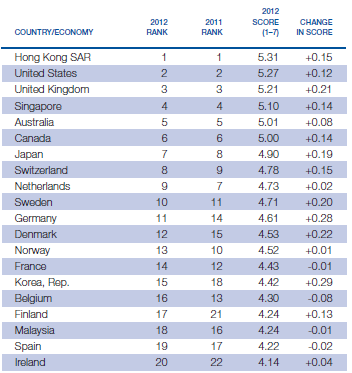 According to this report Hong Kong SAR gets first place and USA in #2 on Financial Development Countries in 2012. Our Indian standings at #40. Click here to download the complete list of Financial Development countries on 2012 in PDF.